Chef Rebecca Alarcon of The Richmond Arms Pub in Houston won an honorable mention in the entree category for this recipe after competing in a contest that celebrates independent neighborhood restaurants. The creamy, flavor-packed yogurt soup features healthy Middle Eastern ingredients with a slant toward Turkish cuisine. It’s easily replicable in foodservice kitchens with its use of cost-effective, widely available ingredients such as lamb leg, yogurt, tahini and mint. 1. For Turkish yogurt soup: In a food processor or blender, combine all ingredients until smooth and creamy. Place 4 1/2 cups mixture in covered container and store in refrigerator until serving. Use remaining yoghurt mixture for lamb marinade. 2. For lamb marinade: Add oregano, rosemary and 2 1/2 tablespoons parsley to remaining yoghurt mixture. Pierce lamb with 1-inch incisions and insert slivers of garlic in openings. Place lamb in large food-safe plastic bag. Pour yoghurt mixture with herbs over lamb. Seal bag, remove air and rotate to completely coat lamb with marinade. Refrigerate for 24 hours. 3. After 24 hours, remove lamb from bag and discard remaining marinade. Pat lamb dry and place in roasting pan, fat side up. Drizzle with oil and sprinkle with pepper. Preheat convection oven to 300 F.
4. Add water to pan and cover with foil. Bake 4 to 5 hours until meat is very tender and easily falls apart. Add more water to pan if necessary. Rotate pan in convection oven one-half turn (180 degrees) after 2 hours of baking. 5. Remove pan from oven and keep covered while resting 30 minutes. Remove lamb from pan and shred into pieces. Skim fat from pan juices and return shredded lamb to pan. Keep warm until serving or cover and refrigerate. 6. To serve, portion 3 ounces refrigerated yoghurt soup into shallow bowl. 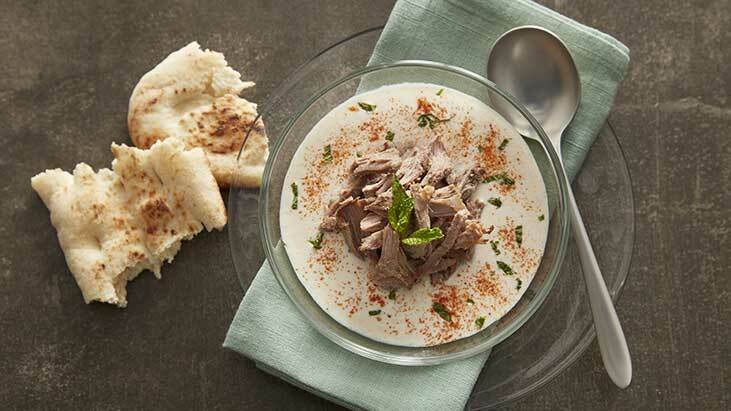 Arrange 2 ounces warm, shredded lamb in middle of each bowl of soup. Sprinkle with paprika and parsley; top with 2 mint leaves.